Today I finally decided to feed a food obsession I have had for quite a while. 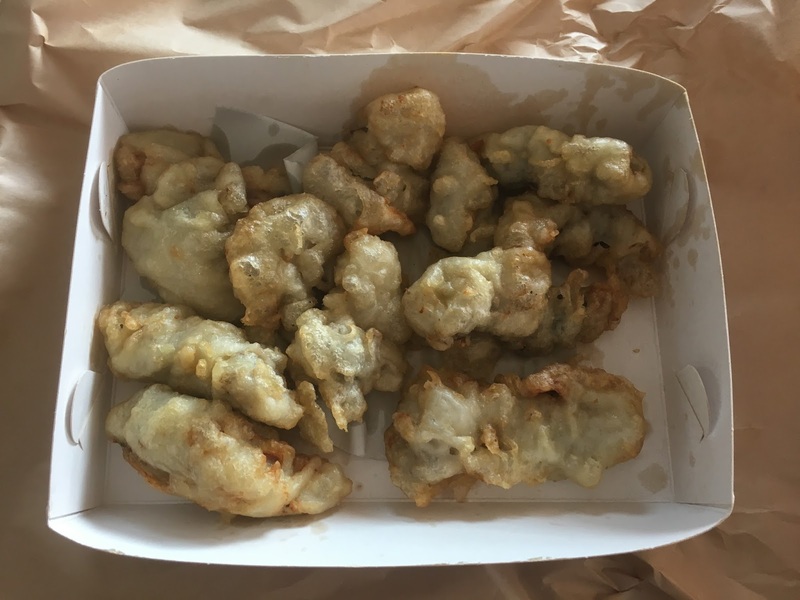 In fact from the time I was admitted to hospital, all I could think about was battered oysters from Mahana Road takeaways. I think George was tired of hearing me describe these beauties down to the last little detail. For instance, an oyster that doesn't shrivel when deep fried, and keeps its beautiful succulent moist texture, and then encased in a wonderful batter that isn't too heavy or too light. My description must have been quite enticing, because one hospital visitor decided after leaving me that they had to have some - and sent feedback that yes my description was perfect, and these were the best. Yesterday I went into the same minute detail with my friend Judy. Her taste buds went into overdrive as well. We had a shared lunch, and look at what we have here. Mana from the heavens. Not one tiny piece of batter or oyster remained. P.S. The delightful after burps were just as nice!!! October 29th - 30th Food Glorious Food!! October 6th They Sent This?